The Healing Church has its roots in Byrgenwerth, and naturally borrows heavily from its uniform design. The focus not on knowledge. or thought. but on pure pretension would surely bring Master Willem to despair, if only he knew." Fading Lake runes and equipment with high fire defense such as the Charred Hunter set will help cut down the damage from Laurence's slacks. Alternately, Clawmark runes will allow you to end the fight faster with powerful visceral attacks; you may also opt to stack Communion or Oedon Writhe runes in order to carry more ammunition or Blood Vials. Bring a few Lead Elixirs for the second phase of the the fight as these can be incredibly useful for preventing the lava from stunlocking you; if you've already obtained the Loch Shield, consider bringing it along as well to block the AoEs. Any serrated weapon such as the Beast Cutter or Saw Cleaver will be effective, but the Whirligig Saw's multi-hit jump attack and sustained L2 chain in transformed mode make it an especially good choice. Laurence is subject to the damage bonuses from Beasthunter gems, so attaching three of these to one of the aforementioned weapons will maximize your damage potential against him; however, elemental weapon buffs such as Bolt Paper are largely ineffective. Single-shot firearms like the Hunter Pistol and Evelyn are very useful for injuring Laurence's head and staggering him, especially when powered up with Bone Marrow Ash; the Cannon and Church Cannon are much less efficient for this purpose due to the high risk of a missed shot. If you have met Valtr in the Forbidden Woods and are equipped with the Impurity rune, you can summon him just inside the cathedral door to assist you. 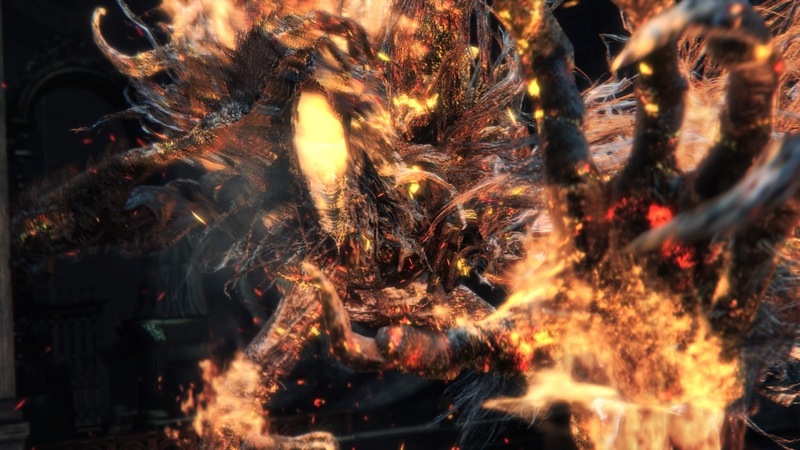 The first phase of this battle will play out much like the fight with the original Cleric Beast, though Laurence is by no means a mere clone and in fact has a number of unique tricks in his arsenal. First and foremost, the majority of his attacks either leave lingering trails of flame or create explosions on impact. Laurence becomes a completely different enemy during the second phase, at which point his lower body will melt away and leave only his torso and head, in this form his severed abdomen continuously leaves a trail of damaging lava as he moves and he will begin using and entirely different set of attacks from Phase 1. His moveset is far more limited during the second phase but also less familiar and predictable, consisting of crawling slam combos, delayed arm swipes and attacks that cover large areas in lingering pools of lava. Target Laurence's head with pistols or the Piercing Rifle to stagger him, then follow through with a visceral attack. 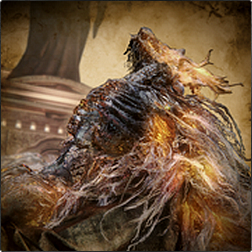 Staggering him works in exactly the same manner as with the original Cleric Beast; he will eventually repair the damage to his head, allowing you to injure it and stager him again. You can also injure Laurence's limbs, but unlike most other bosses this will only stun him temporarily and does not actually increase the damage he receives. The Whirligig Saw's transformed L2 attack will quite literally tear Laurence to shreds, especially if you've also set it with Beasthunter gems; fast weapons with serrated bonus such as Saw Cleaver and the Saw Spear are also ideal for dishing out heavy damage as quickly as possible. If you are having trouble with the lava stunlocking you to death during Phase 2, try using a Lead Elixir - it'll give you enough super armor to walk through the flames without flinching, though you'll need to keep a close eye on your HP. The Loch Shield will absorb the impact and most of the damage from his AoEs, though it is NOT effective for blocking the actual physical swings themselves. 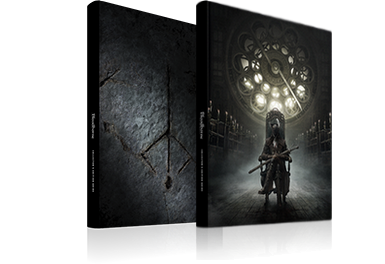 You'll face Laurence in a rectangular hall identical to Yharnam's Grand Cathedral, where you originally faced Vicar Amelia. Keeping the fight to the room's long axis and taking care not to back yourself into the corners is crucial, you'll need to be especially wary of the pilasters jutting out of the walls at intervals as you can become caught on these while skirting the edges of the hall. If Laurence backs into a corner or against a wall, lure him back toward the center of the room so that you have enough space to dodge his attacks. During Laurence, the First Vicar grab attack animations, damage can NOT be reduced by repeatedly pressing buttons (mashing). For more information about Laurence check the Laurence's Skull page. One-Armed Grab No Executed with the left arm. Slow windup; roll or quickstep behind him or quickstep backward. Two-Armed Grab No Frontal grab with a slow windup; strafe or quickstep backward out of range. Fire Slam No Single frontal open-palmed ground slam that generates a small explosion. Resembles the first hit of the Overhead Claw, but has no followup. Quickstep backward at mid range or forward past him at close range. Double Slam No Two advancing ground punches in rapid succession. Both punches create small explosions. Quickstep backward twice at mid range or forward twice past the attacks at close range. Heavy Double Slam No Slower version of the Double Slam that generates larger explosions. Quickstep twice forward clockwise past the first hit from anywhere inside mid range; if on the outer edge of mid range or farther, quickstep backward three times. Retreating Slam No Quick frontal ground slam that generates a small explosion, followed immediately by a backstep that repositions him facing you. Quickstep backward once or forward through the attack. Lunging Swipe No Lunges forward and swipes a wide frontal arc with his left arm, leaving a trail of lingering flames; quickstep forward or counterclockwise through the swing. Slam Combo No Two slow ground punches followed by a downward slam that generates a small explosion of flames; quickstep backward one to two times at mid range or forward past him if extremely close. Left Combo A No Four-hit combo with his left arm starting with a ground punch followed by two horizontal swipes and a frontal shove. The shove inflicts heavy knockdown. Quickstep forward or sideways through each swing in the opposite direction. Left Combo B No Five-hit combo with his left arm starting with a ground punch followed by four horizontal slashes.The final three slashes are performed leaning forward and have increased range. Quickstep backward three to five times at mid range or forward past him at close range. Right Combo No Opens with a right-handed horizontal slash and alternates between left and right for three more horizontal swings.The fourth swing will be either a close-range swipe or a mid-range forward dive depending on your distance from him. Quickstep forward past him through each attack at close range or backward three to four times at mid range. Variable Combo No Can chain an unlimited number of horizontal slashes, ground punches and forward shoves in random order. Quickstep forward through each attack at close range or backward out of reach at mid range. Advancing Lunge No Extremely quick two-hit forward lunge with almost no warning. Both hits generate explosions. Mainly used at short range, but has very long reach. Quickstep forward past his right side one to two times. Flying Press No Jumps high into the air and performs a rapid falling body slam. Can change direction midair and has strong tracking; quickstep or roll toward him and he will pass over you. Overhead Claw No Mid-range overhead slam with his left arm that creates a small explosion of flames, sometimes followed by an upward swing which generates a much larger explosion. Preceded by a scream and has a long windup; he also digs his claws into the ground on the first hit, in contrast to the open-palmed Fire Slam. Quickstep forward past him from close range or backward from mid range. Recovery No Surrounds himself in a red aura and heals injured limbs. Doesn't actually restore HP; simply repairs body damage. Phase 1 Strategy: In general, quickstepping forward through Laurence's combos and baiting his grab attacks provide some of the safer opportunities to attack him from behind with R1 chains or to heal yourself If necessary; strafing backward out of range of his two-hit forward lunges and performing a jump attack after he misses the second swing is another good chance to deal damage. A third such opportunity comes while he is recovering injured limbs since he is helpless during this animation; additionally, injuring a limb will cause him to stumble and buy a little extra time for another attack or two. If you aim to injure his arms or legs, it is often easier to lock off and circle him manually while using dodge rolls to avoid his backward swipe attacks - the two targetable points on his body are very high and will often foul attempts to strike low enough to injure his legs. When fighting locked-on, be sure to target the lower point (on his abdomen) as attempting to dodge his attacks while locked onto his head makes it harder to avoid taking damage. It is possible, though extremely difficult, to avoid the explosions created by his slam attacks using the quickstep's invincibility frames to dodge through them; however, beware that the large explosion on the second hit of his Overhead Claw (when he pulls his claw out of the ground) is large enough that it extends a short distance behind him and can still clip you coming out of a quickstep with poor positioning. You can also attack him one or two times after dodging his Fire Slam, but be sure not to get caught at pointblank range when the AoE occurs. If you are behind him at fairly close range, it is possible to avoid his Slam Combo simply by strafing sideways and strike during his recovery period after the final hit. Alternately, to avoid this combo from the front, quickstep backward away from him. When the AoE from the third hit dissipates, he will be left recovering for a few seconds during which it is possible to quickstep forward and attack him. Lava Launcher No Long-range forward conical stream of lava that remains on the ground for several seconds and inflicts residual damage. Quickstep or strafe sideways as needed, or quickstep forward toward his right side. Rear Lava Gush No Close-range frontal AoE slam while gushing a large pool of lava behind him out of his severed abdomen. Quickstep away from him two to three times at close range and beware that he will follow up with a horizontal swipe if you stand in front of him for too long. Crawling Combo No Drags himself forward using up to seven overhead claw slams often ending with a left-handed horizontal slash. Quickstep left twice and continue strafing or quickstepping clockwise as he circles you. Delayed Slam No Single overhead slam with his left arm after a long windup, sometimes followed by a horizontal swipe. Has strong tracking and must be dodged very late, just before he brings his arm down - quickstep sideways or forward past it. Phase 2 Strategy: When Laurence's HP falls below 40% the bottom half of his body will disintegrate leaving only his torso, arms and head. In this state his mobility is drastically reduced and he loses access to his entire Phase 1 moveset. 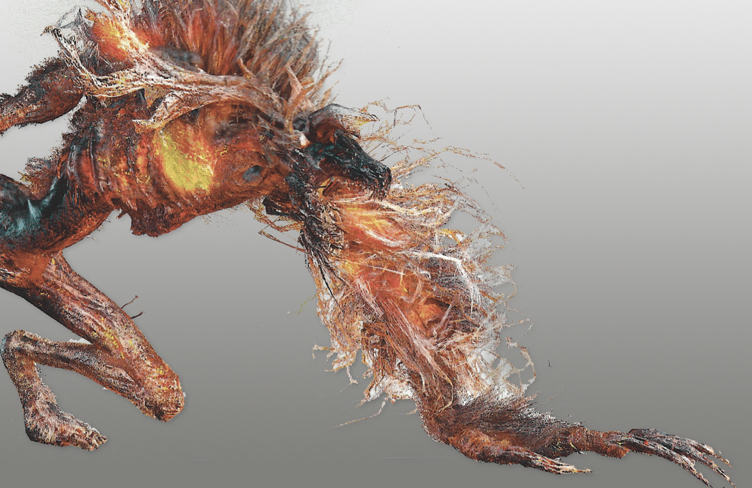 His severed torso constantly spews lava that lingers on the ground for a short period of time, causing fire damage and flinching if you touch it. The best time to attack Laurence or restore your HP during this phase is during his Lava Launcher; he will telegraph this attack with very obvious shudders and screams, providing enough warning for you to quickstep toward his right side and strike several times while he is spitting lava. This move has moderate lateral tracking and leaves large pools of lava on the ground which cause fire damage and heavy stunlock; the stream of lava itself inflicts damage and hits multiple times, and a direct hit with this attack will usually stunlock you to death. The Whirligig Saw's transformed L2 is ideal for piling on damage from Laurence's right side during this move as it can be used while strafing clockwise to avoid the boss' frontal attack area. Another good chance to attack comes during the Rear Lava Gush, though you'll need to dodge the frontal AoE before positioning yourself to strike his head and will also need to avoid the horizontal followup swing at the end. Laurence, the First Vicar/Hunter's Nightmare: In plain sight just inside the door of the Grand Cathedral. You must not have killed Valtr in the Forbidden Woods. You must be equipped with the "Impurity" rune and have not summoned Old Hunter Henriett. Must have obtained Laurence's Skull from the altar elevator. Note: When you summon Valtr, he will appear wearing his helmet and will be identified as "Valtr, Master of the League" until you have completed his quest and obtained the Master's One-Eyed Iron Helm. From this point onward he will be summoned as "Valtr, Beast Eater" and will appear without his helmet. He is stronger as "Beast Eater" so it's worth completing his quest before summoning him for these fights.